This recipe has been updated! 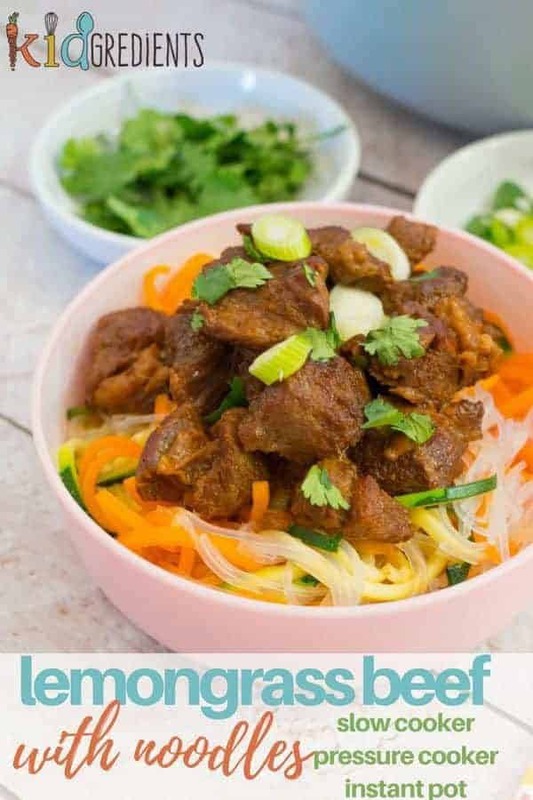 I decided to make this again and try it out in the pressure cooker as well as the slow cooker. 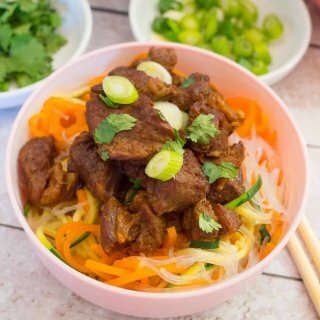 Lemongrass beef with noodles is an awesome kid-friendly dinner. 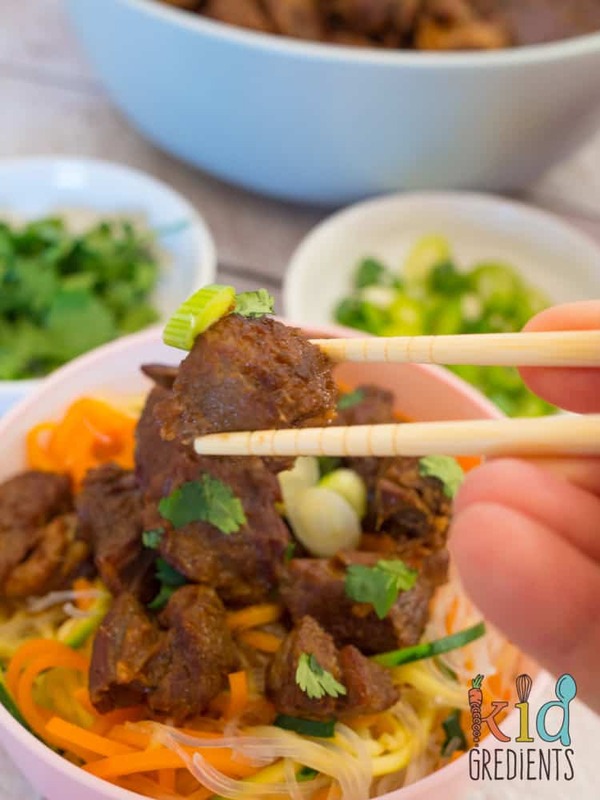 I cook the noodles and zoodles and carrot noodles separately and then allow the kids to add their lemongrass beef to the noodles and top with coriander and spring onions if they want to. A lot of food in the slow cooker tastes the same. It kind of ends up stewy and wet and not too flavourful. I totally agree though, it’s very convenient to come home to a cooked dinner with tender meat and a nice sauce. 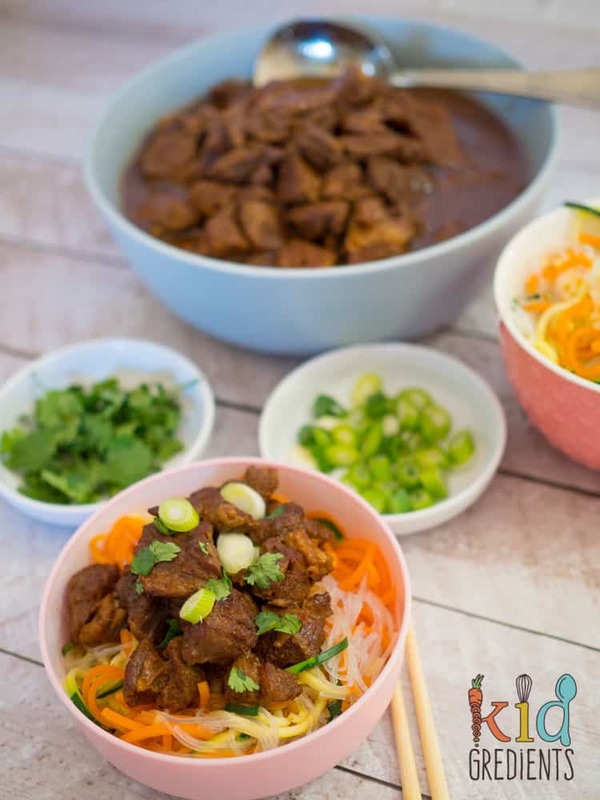 You don’t need to just cook stews in your slow cooker, and for this lemongrass beef, you can choose to use your pressure cooker instead- meaning dinner in 35 minutes instead of 8 hours! But, it’s time to bash down some slow cooker myths. You can cook more than a stew. You don’t need packet mixes. You can cook something that won’t have that slow cooker “sogginess” about it. 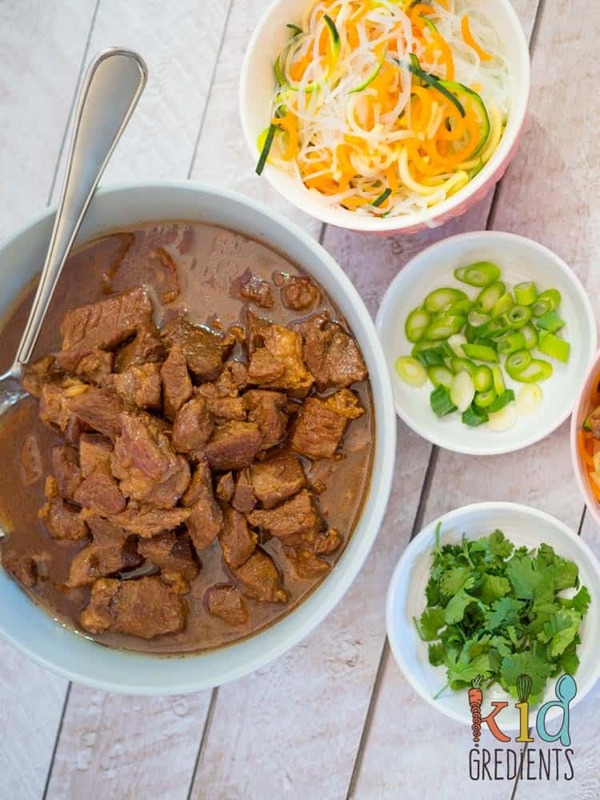 This lemongrass beef is designed as a “make it your way dish, so after cooking, you can add as much or as little of the cooking liquid to it! And BTW: those aren’t all noodles in the picture- there are zoodles and carrot noodles as well, because that is how we roll! I recently converted another slow cooker meal to have a pressure cooker method too- Moroccan lamb! 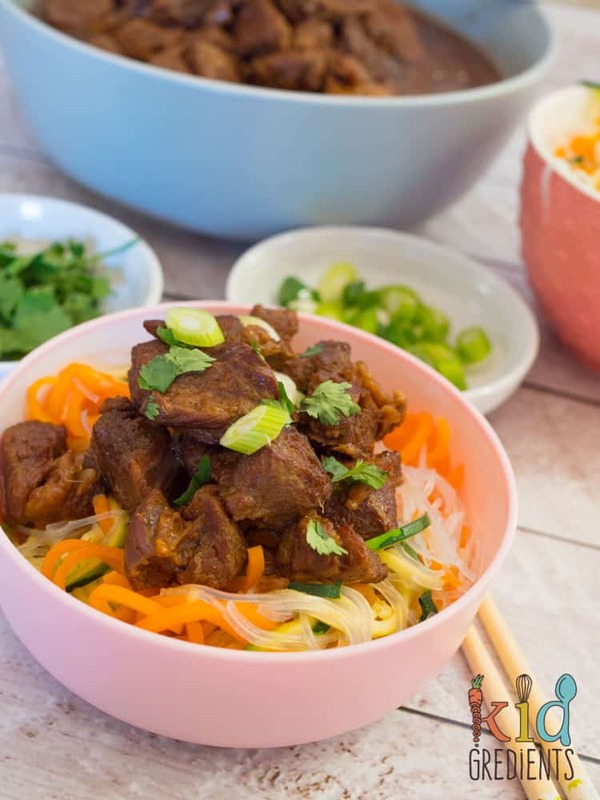 This lemongrass beef is a sure fire winner for weeknight meals! 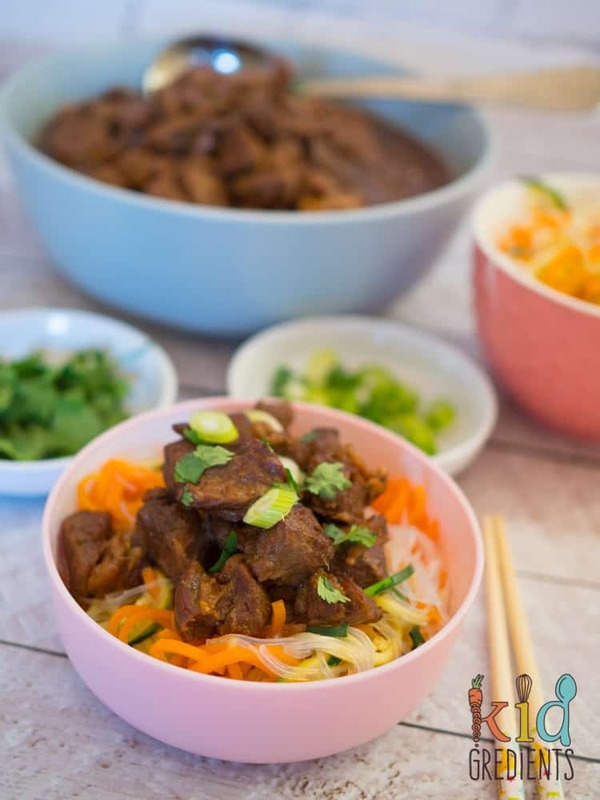 Super delicious with noodles and a kid favourite. Combine the lime zest and juice, onion, chilli, lemongrass and ginger in a food processor or blender with 1 tbsp of water. Blend until it forms a paste. In a frypan over high heat sear the beef cubes until browned.Set aside. Add the paste to the frypan and fry for about 1minute or until the lemongrass is soft. Add the beef back into the pan with any juices and coat in the paste. Pour the sweet soy and fish sauce over the beef add the star anise and cinnamon, heat for one minute then remove all to the slow cooker. Add 2 cups of water and put a teatowel under the slowcooker lid. Boil the noodles according to the packet instructions (mine said 5 minutes). Add the zoodles and carrot noodles. Put as much beef as you want over your noodles and zoodles then add some sauce. Add the coriander and spring onions. I let the kids make the choices about how much of each they want! Combine the lime zest and juice, onion, chilli, lemongrass and ginger in a food processor or blender with one tbsp of water. Blend until it forms a paste. In the pressure cooker, at browning temp (high heat) sear the beef cubes until browned.Set aside. Add the paste to the frypan and fry for about 1 minute or until the lemongrass is soft. Pour the sweet soy and fish sauce over the beef add the star anise and cinnamon, heat for one minute. Add enough water to cover the beef cups of water. Close the pressure cooker and cook for 30 minutes at pressure. Cook the noodles as per the packet instructions add the zoodles and carrot noodles to the hot water for a few minutes then drain. I used my Tefal cook4me to make this.